The 20th Dragon Ball movie will officially bring fan-favorite Broly into canon, where he can beat up everyone from Vegeta, Frieza, and even Goku. Dragon Ball Super: Broly made a splash here at Comic-Con with its panel that debuted the English-language dub to be released by Funimation domestically in January 2019. Watch Broly take on Goku and his crew now! 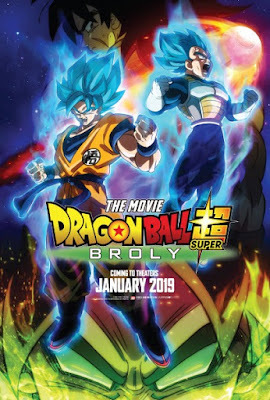 The film follows the events of Dragon Ball Super, the first original storyline in nearly two decades from original creator Akira Toriyama. This is also the kickoff destination for Funimation's North American tour that will encopass 7 cities in the U.S. and Canada. And why shouldn't they take this film on the road considering the successof 2015's Dragon Ball Z: Resurrection ‘F'? If I'm honest, nearly everything said at the panel was flying over my head, having not seen Dragon Ball Super. I remember the Broly character, but to me he's just another opponent who was over powered so he could compete with Goku and force him to reach some new Saiyan power level. Is there any reason I should think differently now?